Ceftioclin is the first domestic ready-to-use emulsion preparation on the basis of a cephalosporin antibiotic of the third generation of ceftiofur hydrochloride. 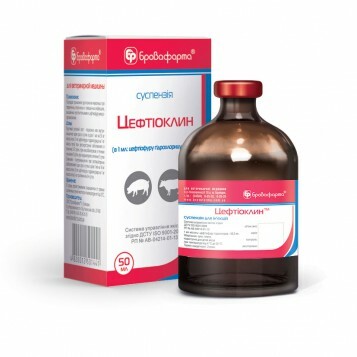 ceftiofur hypochloride – 50,0 mg.
– pigs: respiratory disease and the treatment of other infections, caused by microorganisms (Haemophilus somnus, Actinobacillus pleuropneumoniae, Salmonella cholerasuis and Streptococcus suis) sensitive to ceftiofur. Cattle – subcutaneously, once a day in a dose of 1 ml per 50 kg of body weight (equivalent to 1 mg of ceftiofur per 1 kg of body weight), period of treatment – 3-5 days. Pigs – intramuscularly, in dose of 1 ml per 16 kg of body weight (3 mg of ceftiofur per 1 kg of body weight) during 3 days. Individual sensitivity of animals to ceftiofur and other beta-lactam antibiotics. Do not mix Ceftioclin with other medicines in the same syringe. Slaughter of animals for human consumption is allowed in 8 days (cattle) and 5 days (pigs) after the last treatment. Meat obtained before the specified period is utilized or used for feeding of unproductive animals, depending on the conclusion of veterinarian. The duration of excretion for milk is 10 hours. Glass vials of 1, 20, 50 and 100 ml. Store in dry, dark place at the temperature from +4°С to +25°С.